Your smile is one of the first things people notice about you, which means it’s absolutely essential to making the right first impression. One of the easiest ways to transform your smile is with teeth whitening. The procedure is pretty straightforward. First, you'll come in for a quick exam to make sure you don't have any leaking fillings or cavities that could be an issue. If everything is fine, we'll take an impression in order to create a pair of custom trays that will fit snugly over your teeth. 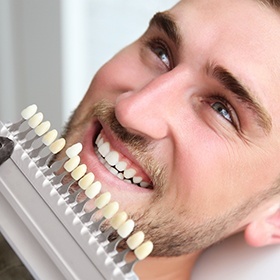 We'll also provide you with a powerful teeth bleaching gel to use in your trays for a period of time each day, generally for a minimum of 20 minutes. You continue that procedure until you achieve the level of whiteness you desire. The trays hold the bleaching agent on your teeth, which contains peroxide. As the peroxide sinks deeply into your teeth, it oxidizes the stains out. The longer you use the bleaching gel, the whiter your teeth will become. While the old stains will be permanently removed, you can develop new stains. You can maintain your brilliant smile with good oral hygiene and occasional touch-ups every couple of years. Maybe you have tried over-the-counter teeth whitening products and were disappointed. You might be skeptical to try teeth whitening again. There is a reason many of those products are ineffective. For instance, while whitening toothpaste may work to remove surface stains, they are not on your teeth long enough for any significant whitening to take place. The whitening agent needs to sink deep into the tooth to lift out stains. Bleaching actually takes place from the inside out. 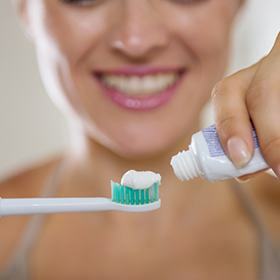 There are some over-the-counter products that do stay on your teeth, however, the level of bleaching agent they are allowed to contain is significantly less than what you'd get at a dentist's office. It will work, but you may have to purchase many kits, depending on the amount of whitening needed, and use the product significantly longer. If you'd like to know if you're a candidate for teeth whitening, you can either call our office to set an appointment, or you can click here to request an appointment online.